Summertime cooking should be easy–and it should be fresh and crisp and delicious. This salad is all of those things. It’s also the reason why I always cook a few extra ears of corn on the cob. I actually pluck a few ears from the pot and place them out of site so my corn-loving husband doesn’t eat them all. He’s been known to consume a lot of corn on the cob! This sunny salad is light, garden-fresh and people are always surprised when they find out how darn simple it is. I never measure a thing–it’s that kind of recipe. For the sake of recording it here, however, I did measure in order to provide guidelines for those who prefer them. But don’t hesitate to add more or less of anything according to taste. Truth be told, as the summer moves along and my basil plants grow, I tend to add increasingly more basil. I figure I can count that as a serving of leafy greens, right? Add the remaining ingredients and toss lightly to incorporate. 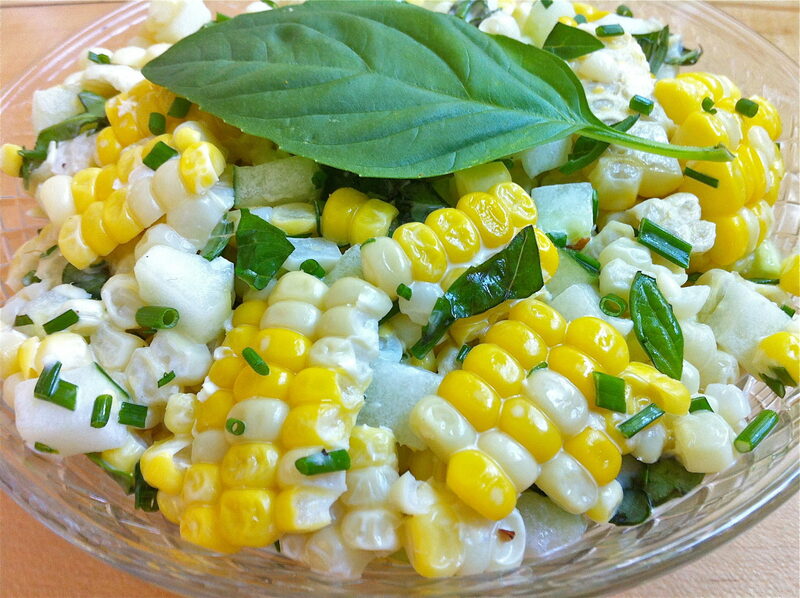 The small amount of mayo will mix with the milkiness of the fresh corn and create a light, flavorful dressing. This recipe can be made with any amount of leftover corn. Feel free to add more herbs to taste and/or eyeball the amount of mayo and other ingredients. You can’t mess this one up! At various times, I’ve also made this salad with halved grape tomatoes, chopped avocado, and/or cooked salmon stirred in. The options are many, but the simplicity of the original is truly divine. For a light, protein-rich summer entrée, I sometimes prepare a version of this salad that includes cooked salmon—canned wild salmon makes a convenient and healthy option. Oooohhh, I love this! So light and fresh for summer. Very nice Ann! I am making this tonight…looks amazing! I hope you enjoy, Anne! Thanks for letting me know! You’re right, this is so simple! Great summer flavor combinations, fresh and healthy. Thanks for sharing this with Summer Salad Sundays, look forward to seeing you again soon! I’m so glad you came over for the recipe, Terra! I love this salad, not only for it’s taste but because it is so easy! I agree, Heather! Raw corn tastes so good, especially when just picked. Frozen and thawed is a great out-of-season option, too! Just wanted you to know that we had what I would call a Fountain Avenue Kitchen Banner Day last Friday. We had dinner guests and we had three Fountain Avenue dishes: Jack’s Favorite Tomato and Cucumber Salad; this Corn and Cucumber salad; and the Blueberry and Peach Pound Cake. All were thoroughly and completely enjoyed. Thank you! Such terrific feedback, Rila…thank YOU! Hi Ann! I bought corn today just so I could make this… ran across this recipe last year and never did get this salad made. I am making tonight..
How long will this keep do you think? Thinking that just the two of us won’t be able to eat all of this in one sitting. I’ve been thinking about you, Mary Lou! Hope all is well! This salad will keep for quite a few days and still taste great. When we have leftovers, everyone here enjoys them for lunch. Enjoy the corn! Thanks Ann! All is well.. just got out of the cooking mode and again, working to get back to it. Last night I made the asiago pesto spread. YUM! I promise to check in more often can’t wait to see what new things are in store! I’m going to hold you to the more frequent check-ins…but we all get in a cooking rut from time to time. Glad you enjoyed the pesto! 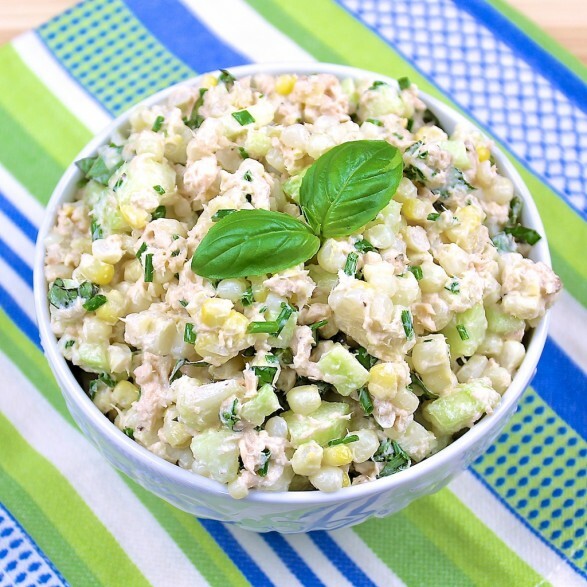 Tried corn, cucumber, basil and chive salad yesterday. So delicious I plan to make more for dinner (or snacking) tomorrow. I also passed the recipe on to numerous friends. A definite must try salad, very refreshing! I’m so happy this was a success and that you shared the recipe, Mary. Thank you for your thoughtful comment!